It is a world where environmental pollution has spiraled out of control. Most of the land is contaminated desert, and there are only a few pockets along the shore where people can live. Those inhabiting these oases are suspicious of strangers, and know nothing about the outside world save for stories of vicious "sub-humans." One day, a young girl named Marine washes up on the shore of one of the inhabited lands. She has no memory of where she came from. She is found by a young boy named Kazuya, who loves the sea and has a natural curiosity about the outside world. The two of them start to become friends... but then rumors start spreading that Marine might be a sub-human, and she is locked up. Now Kazuya must help her escape, and uncover the mystery of who she is and where she came from. 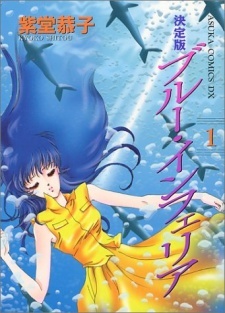 Blue Inferior had one volume published in English by ADV Manga on June 8, 2004 before the license was dropped and the publisher went defunct.